The St. Johns River Water Management District’s fiscal year (FY) 2018–2019 Adopted Budget is $142.5 million. The budget was adopted at a public hearing on Sept. 25, 2018, for the fiscal year that begins Oct. 1 and ends Sept. 30. The property tax rate for FY 2018–2019 is 25.62 cents for every $1,000 of assessed property value. The millage rate is about 6 percent less than the FY 2017–2018 millage rate. In addition to property tax revenues, the budget includes funding from state, federal and other sources, including revenue from timber sales, cattle leases and permit fees, and interest earnings. 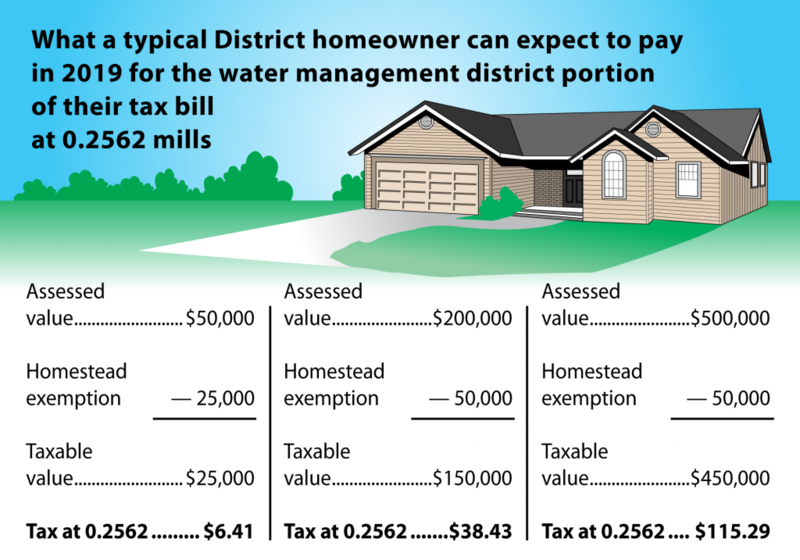 Under a 0.2562 millage rate the owner of a $200,000 house with a $50,000 homestead exemption would pay $38.43 in property taxes to the district. More than $54.92 million in cooperative funding, with up to $3.5 million specifically to support water projects in economically disadvantaged rural communities and for innovative technologies, as well as springs and priority water body protection and restoration, water conservation initiatives with public water suppliers, and projects to enhance the reuse of reclaimed water. $3.93 million in state funds for Lake Apopka projects, including enhancements to the marsh flow-way system. $3 million in legislative funds for the Doctors Lake Nutrient Reduction Projects. $8.13 million in legislative funds for the Black Creek Water Resource Development Project to provide aquifer recharge in northeast Florida.